This book was provided by the publisher. It is 2073 and journalist, Eric Seven, is visiting the remote and secretive island known as Blessed. Little is known about the island except a few rumours: no-one aging, no children being born and a very rare flower with unusual properties. Here Eric finds things not as they seem and he is inexplicably drawn to a young local woman, Merle. Things spin out of control as they rush to a chilling conclusion, one that echoes a moment 10 centuries earlier when a King and his Queen are torn tragically apart. Through the centuries their souls search for each other, reuniting in various guises – mother and son, artist and child, lovers, and victims. Is there a way for them to be together once and for all. This is a YA book with a difference. It is like a series of short stories linked together by the thread of Eric and Merle searching for each other. 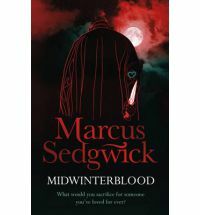 Midwinterblood is a clever story that contains elements of so many things – a little gothic and gruesome, a touch of thriller and a dash of friendship and family. The relationships explored through each of the time frames are unique, no two are the same. Sedgwick has crafted a fascinating tale that goes back through the generations. It draws you in, you want to know, even though knowing takes you to dark places. There is a thread of inevitability and hope through each of the stories. It draws you to an end that is at once sad and hopeful. A different and interesting read. Purchase: here or use Booktopia logo on side of page.